I love my melon baller, and this time of year I use it nearly every day. If you’ve ever cut a peach in half and removed the pit, you’ve noticed that the flesh that touched the pit is just a little..um..unappetizing. Sometimes the peach flesh is hardened, other times there are little specks of mold if a gap forms between the pit and the flesh. Rather than try to cut it out with a paring knife, I use my melon baller to remove that interior flesh cleanly and quickly. A melon baller is a quick and easy way to core apples. Simply cut the apple in half, put the melon baller over the core, press into the apple and turn. The core is gone, with no wasted fruit! Remove the seeds and base from a pear. Cut in half and remove the core as you would with an apple, then put the cup of the melon baller on the base (blossom end) of the pear to remove that part. Dig out black spots and sprouted eyes from a potato. Hollow out red potatoes for stuffing. Use it to scoop cookie dough if you don’t have a cookie scoop. Scoop out cute little balls of ice cream for a kid’s party. Scoop little balls of chocolate ganache for making truffles. 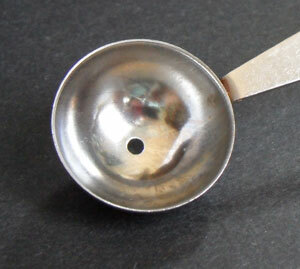 Basically, a melon baller can be a substitute in a pinch for a little cookie scoop and the endless uses that tool has. I do know someone who uses a round measuring spoon for many of these tasks instead of owning a melon baller, but my measuring spoons are too thick to work that way (as is my cookie scoop). Also, I like that a melon baller has a hole in the base of the cup so you can poke out whatever you’re scooping in case it gets stuck. The handle on my melon baller. Note the groove for my index finger. A comfy handle. You do have to use a little force, depending on what you’re scooping, and it helps to have an ergonomic handle to grip. If it’s got a little texture to it, so much the better for holding onto it when your hands are messy with fruit juice or cookie dough. A thin, straight, metal handle would be about the worst option. I like my handle because it’s thick, tapered, has a little groove for my index finger, and a good length for balance and control. It could be squishier or more textured, but I’ve never had a problem hanging onto it. A sturdy cup with thin edges. I saw a melon baller once that had a little lip on the edge of the cup, instead of a straight edge. Why on earth would they essentially dull the cutting blade? All you’re gonna do then is crush more fruit when you’re trying to cleanly cut something, if the thicker edge could cut through it at all. No, you want a thin but strong edge so you get a clean ball with less damage to whatever you’re scooping. My melon baller is so old that I can’t find anything like it on Amazon. 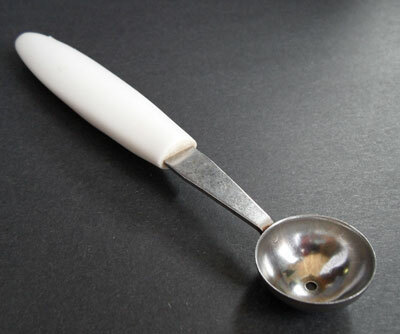 But this Leifheit model looks to have a good, long, tapered handle (with a nonslip red insert), a thin-edged bowl, and even a hole for hanging. Yes, it’s a little more expensive, but I think a good handle is worth it. If you want a little more versatility, the Oxo melon baller comes with two cups, about a teaspoon and a half teaspoon capacities. While I like having options, I worry that the handle itself will be too small for my pudgy hands, and wonder if I’d hit the cutting board with the other cup while trying to scoop something. Knowing Oxo, I’m sure the handle has a great grip to it, though. A stainless steel cup would be great. Mine says that in little letters, but there’s no brand name. (Just Made in Japan.) It’s probably dishwasher safe, but I only put dishes and silverware in the dishwasher, not kitchenware, so I’ve never tried. It just takes a quick rinse after I use it and it’s good to go. Do you own a melon baller? What do you use it for? Do you love it? Let me know in the comments! Thank you so much for stopping by my site!! your the first person from the SITS that has stopped by and commented me! I’m always looking for recipies and such, so I will def. bookmark you and check in again!! I think we have a melon baller somewhere!! we hardly ever have fruit, but I am now wanting some just to try out the things you were talking about!